The Guardsman, unlike most watch clocks, provides an uninterrupted record of a watchman's activities for up to 120 hours. For your company, its extended time-keeping capacity translates into total control and accountability for weekends, holidays and plant closings, as well as routine overnight patrols. The advancement of the tape is synchronized with the clock mechanism so that consecutive station registrations appear as an unbroken band of numbers; missed stations appear as conspicuous gaps. The Guardsman boasts rugged construction, including a die-cast aluminum housing, heat-treated crystal, and a riveted and reinforced case of harness leather. · Embossed record made directly from raised numerals on the recording keys without ribbon, carbons, or inking devices. Highly accurate eight-day shock resistant movement with 11-jewel escapement. · Will accommodate up to 40 stations. · Tampering detector indicates if clock has been opened or closed. · Requires winding only once per week. · Tapes are virtually impossible to counterfeit. · Underwriters Laboratories listed and Factory Mutual approved. Meet the lowest-cost member of the Detex watch clock family. Our battery-operated Newman Quartz watch clock delivers all the dependability you'd expect from a Newman, but with a reliable quartz movement. Like its famed mechanical counterpart, the Newman Quartz watch clock provides a 24-hour record directly embossed on a paper time dial by means of raised numerals on the recording keys. The Newman was the first portable watch clock of American design to be sold in the U.S. 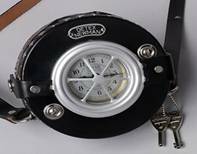 It was also the first portable watch clock to receive the Underwriters Laboratories' listing and to be approved by Factory Mutual. It remains a watch clock approved by insurance companies worldwide. · The only dial watch clocks that provide an embossed, 24 hour record made directly by raised numeral on the recording keys without ribbons, carbons or inking devices. · Advancement of the dial is synchronized with the clock mechanism, so that consecutive station registrations appear as unbroken bands of numbers; missed stations appear as conspicuous gaps. · Dials and tapes are virtually impossible to counterfeit. Trust Detex to provide the industry standard for reliable Guard Tour Verification. In today's corporate environment, sophisticated data collection and auto-ID systems are more important than ever. Data collection systems require check points that are unique, manipulation-proof and absolutely reliable. ESCORTE gives you all this - and more! has led in the development of guard tour products, from our basic, trusted watch clock’s to our advanced electronic Escorte system. Designed for reliability and manufactured to exacting quality requirements, our guard tour products set the standard for the industry. All of the Escorte systems are comprised of one or more Data Acquisition Units (DAU), one or more parallel or serial Data Transfer Units (DTU), Data Strips for identifying locations and officers’ names, and other related items for programming and producing reports documenting security officer activities. The electronic DAU, which weighs only 8.7 ounces, is shock resistant, waterproof and designed to minimize the possibility of tampering or altering the data. Its electronic design incorporates the latest in low power consumption technology which extends the life of the battery far beyond other systems. Data transfer to a printer or computer is accomplished through the use of the Data Transfer Unit (DTU). Data is transferred between the DAU and DTU inductively, without external connections, which further reduces the possibility of tampering. Each Data Strip contains a sealed magnetic tape which is etched with a unique bar code. The advantage of this design is that it cannot be copied or reproduced in any manner. It also allows the Data Strip to be read through dust, grime, grease or even light coats of paint. The Escorte system is available for use with or without a personal computer (PC). 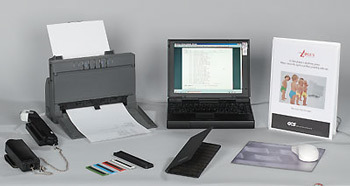 The Escorte Patrol Manager does not require a computer for daily operations; the DAU is downloaded directly to a parallel or serial printer to provide the basic report format. The reports can be further enhanced with the DAU Utility software by adding descriptions for the locations of the Data Strips, officers’ names, and incident descriptions. For users that prefer the increased storage and flexibility of a PC-based system, we offer a full range of guard tour software. Our DOS-based software, the basic Easy Tour and the full-featured Argus programs, remain popular with many users because of their simplicity, ease of use and value. For our clients who prefer the Windows environment, our WinArgus software, which operates under Windows 3.X, 95, 98 and NT, meets or exceeds the requirements of most users. The top-of-the-line Prisma package is designed for use primarily by contract security firms for easy management of guard tour reporting for numerous clients or clients with multiple sites. Prisma is a 32-bit application which operates under Windows 95, 98 and NT. THE latest innovation in guard tour verification technology: the new GCS Proxi Pen Data Acquisition Unit and Win DAU reporting software. Proxi Pen’s data points are Radio Frequency Identification (RFID) tags, which the Proxi Pen senses and reads automatically whenever they come into its reading range. You don’t need to actually touch the RFID tag to get a quick, accurate reading; just get close! This means that ProxiPen can read a tag even if it is wet, frosty, dirty, greasy, or painted over. In fact, ProxiPen’s RFID tags may be concealed behind wallpaper, sheetrock, plaster, paneling, mirrors or any other nonmetallic surface; a real plus in applications where aesthetics or vandalism are considerations. Toughness plus advanced technology – but easy to use. 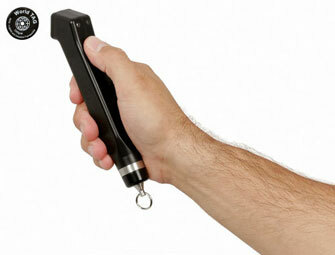 ProxiPen is compact, lightweight and easy to use since it has no external controls. Correct data readings are confirmed by visible and audible signals. Its electronics are sealed in a tough polycarbonate housing, making the reader completely waterproof and resistant to heat, shock and hydrocarbons. Change your own battery. With its low power consumption, ProxiPen delivers 50,000 data readings from one “AA” battery, which you can change yourself without tools. Any stored data is preserved in non-volatile memory. To discourage tampering, the ProxiPen disables itself if the battery is removed for longer than 10 minutes and records the date and time the battery was removed. The ProxiPen is then easily reset with the Win DAU software. The price is right! 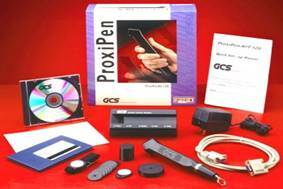 The ProxiPen kit includes everything you need: a ProxiPen, a data transfer unit, 33 RFID tags, the Win DAU software, and an incident book – all at an incredibly competitive price. And the Win DAU software can be used with other GCS data acquisition hardware, including the popular Escorte system – in combination with the ProxiPen if so desired. the latest innovation in guard tour verification technology: the GCS ProxiPen Data Acquisition Unit and Top Guard Patrol reporting software. ProxiPen’s data points are Radio Frequency Identification (RFID) tags, which the ProxiPen senses and reads automatically whenever they come into its reading range. You don’t need to actually touch the RFID tag to get a quick, accurate reading; just get close!